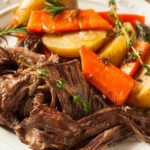 It’s time for a new Instant Pot recipe and one of the most requested and most popular recipe is Instant Pot Roast Beef and Vegetables. One of the main reasons that I purchased my Instant Pot was to make roast beef in a fraction of time that it took to make in my slow cooker. 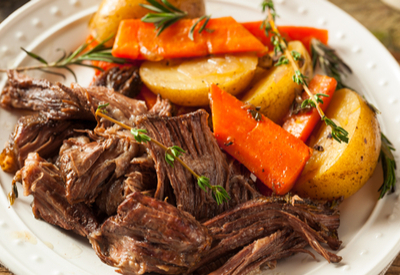 Instant Pot Roast Beef and Vegetables – Tender, juicy and cooked all at the same time! I wanted it to have fall apart tenderness without losing the savory flavor of it being cooked all day long. So when I read stories upon stories of other people making Instant Pot Roast Beef and it coming out dry and tough I was worried. I was determined to recreate the moist and juicy, fall apart tender roast beef that I was familiar with. This was difficult to do because I wasn’t willing to waste cuts of beef in the process. My only option was to spend several weeks researching recipes and reading reviews on those recipes that others had trialed. It was amazing what variations that you can find on the internet! The cook times ranged from 15 minutes to 90 minutes! No wonder why everyone was confused! There were some recipes that seared the meat prior to cooking and some that stated they would NEVER throw in vegetables at the same time as the beef. The thickness of your roast will determine the amount of cook time. I don’t think that I found two recipes that were the exact same. And after reading all of the reviews I think I was even more confused. The recipe was tough and chewy for one person, and the very next review the reader stated that the outcome was perfect! I absorbed all the information, and went back to the basics of what I knew and found true in my own kitchen. 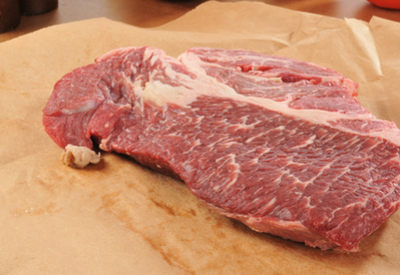 First of all the thickness of the meat should be your first factor in determining cook time. The thicker the meat, the longer it will need to cook, regardless of how many pounds it is. For instance, a roast that is one inch thick will require less cook time than a 2 inch cut of meat. I have found that for every increase in an inch of thickness, you need to increase your cook time by 10 minutes. As for the vegetables, there are a few guidelines that you will want to follow to make sure that your veggies don’t turn to mush during the cooking process. Use large ‘baby’ potatoes for this recipe. 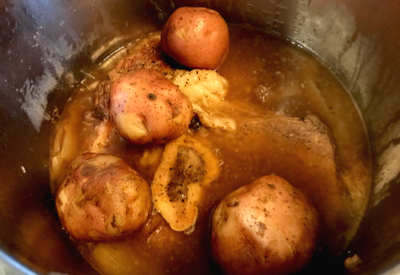 If you use standard russet potatoes cut in quarters, they will fall apart. Keep the baby potatoes whole with the skins on. You will end up with nice, tender potatoes that hold together during the cooking process. Baby potatoes are added directly on top of the beef prior to cooking. If you are wanting to add carrots, it is best to use standard garden carrots. You know the ones that are large and long with the greens on top. First of all the flavor of garden carrots far outweigh those baby carrots that you buy in a bag. In addition, if you cut them in half, they can withstand being pressured cooked. However, if you like your carrots super crunchy, then cook them after you remove the meat to allow it to rest. You can also add fresh green beans at this time. Pressure cook them in the liquid from the Instant Pot Roast Beef for 1 minute on high pressure. Quick release the pressure and there you have it! Crunchy carrots and green beans cooked to perfection! Tender chuck roast and vegetables all made together in the Instant Pot. A classic homemade meal made in a fraction of the time of a traditional slow cooker recipe. Season pot roast with salt, pepper, and Italian seasoning on each side and set aside. Add 2 Tbsp. Olive oil to Instant Pot and set to sauté. When the display reads HOT, add pot roast and sear for 4-5 minutes on each side. Remove and set aside. Turn Instant Pot Off/Cancel. Add beef broth to the pot and deglaze by scraping any bits off the bottom of the pot. Return the roast to the pot and any extra juices from where the roast was resting. Add Worcestershire sauce to the meat. Add veggies on top of the meat, distributing them evenly on top of the roast. Place lid on Instant pot with valve in the sealed position. Pressure cook/manual on high pressure for 35 minutes for 1 inch thick roast and 45 minutes for 2 inch thick roast. Once time is up, let the pot natural release for at least 15 minutes, then perform a quick release of any remaining pressure. Remove vegetables and roast from instant pot. Slice and serve. **If you want to make green beans with this meal: add fresh picked green beans to the pot after you remove the meat and veggies. Set the Instant Pot on Pressure cook/manual for 1 minute and perform a quick release of pressure. **If roast is too large, you can cut it in sections and sear individually. ← Homemade Ice Cream Sandwich Recipe – A Great Summer Treat! You don’t know how glad I am to see that you are not telling us to cook the roast for 75-90 minutes!! So many of the recipes have you overcook the roast. At 45 minute the roast is perfect. Ten minute NPR then a quick release. I do cut my roast into three pieces and brown on all sides so even if it is a bit thicker than the 2 inches it comes out great. My family loves the regular (no baby) cut carrots cooked in the liquid under the roast where they absorb all the wonderful flavors from the meat and the seasonings. I have cooked as much as 5lbs in with the roast! They all get eaten! They are soft but do not fall apart. We prefer mashed potatoes with the gravy so I do not put them in the pot. I use my second IP to prepare the potatoes for mashing while the 1st one depressurizes. I have never used Italian seasonings. I add a cup of brewed coffee to the beef broth. It acts as a meat tenderizer and does not add a coffee flavor at all. The gravy is wonderful. Thank you for explaining thickness of meat and the time correlation. You are welcome – it really helps to understand that not all meat the same weight can be cooked the same! Sirloin tip roast is a lean cut of beef and wouldn’t be as tender as a fatty cut such as Chuck Roast. I would save the sirloin tip for stew or braising. What do you do to thicken the liquid into a gravy? I personally prefer arrowroot powder. But you could also use a cornstarch or flour slurry and saute until the desired consistency is reached. Wow, this recipe sounds great! My question is if one increases the amount of meat doses the amount of liquid need to be increased as well? Good question. The amount of liquid would remain the same.